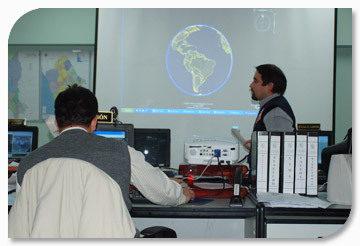 The Emergency Committee (EC) is the center for the management of major emergencies and disasters. It represents the highest decision-making body, where careful monitoring of the changing effects of a disaster are done, and where the actions needed for effective and timely response are defined. The EC is multidisciplinary and multisectoral, and includes the participation of political and technical entities, representatives of the disaster management agency, the armed forces, specialized national and international agencies, and nongovernmental organizations. Aside from an intersectoral EC, there can be sectoral ECs in areas such as health, but their operation should be integrated and coordinated with the intersectoral EC. In addition to a national EC, there can be local, district,, regional, or municipal ECs. Location: Physically, the EC should be located in a room built for the purpose or in a government office that is easily accessible, preferably distant from highly crowded areas of a building. Safety: the construction should be structurally safe, and have security measures to restrict access by unauthorized personnel. Rooms: a moderately complex EC has spaces for specific purposes: the situation room, the press, meetings, and a command center. Equipment: the EC should be furnished and have communication equipment, a computer network (with necessary software), projection screens, , directories, maps and other essentials. Backup systems: communications, water, electric power. Logistics: supplies, food, transportation, rest areas, first aid. An EC does not operate effectively without a flow of information from the various institutions and actors that are at the site of the disaster. The Federation of the Red Cross manual on organization and operation for EOCs provides more in-depth information on this subject (this manual is in Spanish). The information that reaches the EOC should be analyzed so that it will be useful for decision making. Information processing and analysis may be conducted in the situation room. Collecting and monitoring information from direct sources as well as from the mass media. Preparing graphic reports, statistical charts, descriptions of trends, and narratives. Preparing material as input for official bulletins. Staff: Multidisciplinary technical personnel and a systems technician. Equipment: computers, Internet, TV, telephone, fax, radio, information packages, database, desk material, etc. Alternate electrical power sources, water, and communications. The situation room can function in the same building as the EOC if physical facilities permit, or can provide information to the EOC via Internet.